If you have a loose bracket that is still attached to the wire, leave it in place and call our office to get it fixed. If it begins to rub or bother you, you can put wax on it until you come in for your appointment. Should the bracket fall off by itself, bring it to your appointment in a bag or envelope. 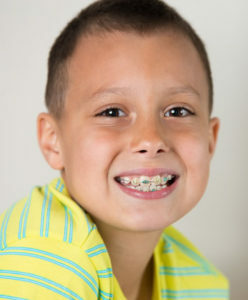 We want to get the bracket replaced as soon as possible to prevent a delay in treatment. Should an appliance such as a Palatal Expander or Herbst come loose, call use to recement it as soon as you can. If any part of the appliance breaks off, bring that piece with you to the appointment in a small bag. If you have a long wire in the back of your mouth, we can generally get in you the office to clip it during any time of day. If you are unable to come by soon after the discomfort begins, use wax to smooth over the offending wire until you can come get it clipped. Sometimes we need to use additional wire ties around certain brackets. These are thin and can become repositioned and potentially bothersome during certain activities like brushing teeth or eating. If one of them begins to bother you, you can use a pencil eraser to tuck it back underneath your arch wire.